As per the Global Industry Analysts report, spending on anti-aging products is expected to reach $291.9 billion by 2015. Seeing the projected level of growth in anti-aging products category, it’s no surprise that beauty and personal care brands, manufacturers and suppliers across the globe are closely monitoring consumer trends for a piece of the market. Contributing in the same league for years, leading natural care professional beauty brands, Lotus Professionals has launched a revolutionary range of anti-aging products- PHTYORx, infused with unique goodness of ginseng and ginger extracts and jojoba seeds. Considered to be the ‘future of skin care’, the entire PHTYORx anti-aging range employs potent organic formulations that administer higher concentration of active botanicals in each product to provide safe and natural care effectively. Each product in the range is free of chemical preservatives, artificial fragrance and colour, making it one of the finest natural care professional ranges available in the market. The range consists of daily morning and evening regimen in the form of cell regenerating anti-aging scrub, intensive repair anti-aging serum, smooth skin anti-aging face wash, skin firming anti-aging crème with SPF 25 and skin renewal anti-aging night crème. Lotus Professional PHYTORx anti-aging range derives its effectiveness in giving a firmer and younger looking skin from active organic ingredients that include ginseng, ginger and whey protein. Ginseng fights wrinkles and boosts skin-firming collagen, ginger acts as an antioxidant and improves the elasticity of the skin while whey protein boosts collagen and effectively reduces the wrinkle depth. Lotus Professionals PHTYORx anti-aging range uses revolutionary organic formulations which firms the skin and gives younger looking skin in just four weeks. This revolutionary range contains anti-aging face wash which effectively detoxifies the skin pores, dissolves make-up and improves skin texture as it gently sweeps away dust and grime, gives refreshing and glowing skin. Similarly, the PHYTORx Cell Regenerating anti-aging scrub exfoliates and clarifies the skin, removes blackheads and whiteheads. While the Intensive Repair anti-aging serum helps stimulate skin-firming collagen to improve suppleness and reduces the appearance of fine lines and wrinkles. The range also includes the PHYTORx Skin Firming anti-aging crème with SPF 25 that helps reduce the appearance of fine lines and wrinkles from the very first application while diminishing crow’s feet, brow furrow wrinkling, laugh lines, frown lines and other skin creases. Also, on offer is the PHYTORx Skin Renewal anti-aging night crème which works all night long to help reverse signs of damage by hydrating the skin, reducing fine lines and wrinkles, repairing daily environmental damage, minimising the appearance of pores and revitalizing the skin. 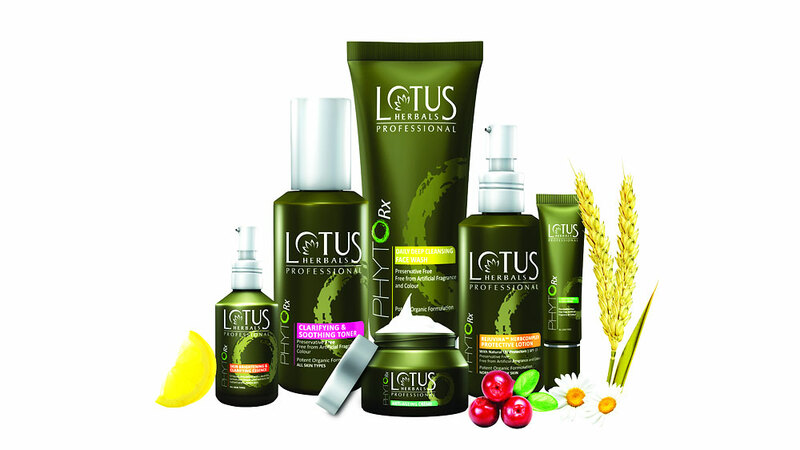 Lotus Professionals PHYTORx anti-aging range is available at leading spas and beauty salons across the country at a price range of between Rs 345 to Rs 745. Ayurveda's role is vital: Minister Naik..